1. A long shawl for all occasions. Since blue is a versatile shade, you can play with a shawl that you can use for all occasions. You may want to look for a shawl that’s longer and made of thinner fabric material, as it offers more uses than a regular sized type. You can use a long blue shawl as a cover for your back, or as a neck accessory just like a scarf. You can also use it as a makeshift jumper in case you want to spice up you preppy look, or as a belt to add a pop of color to your waist. 2. 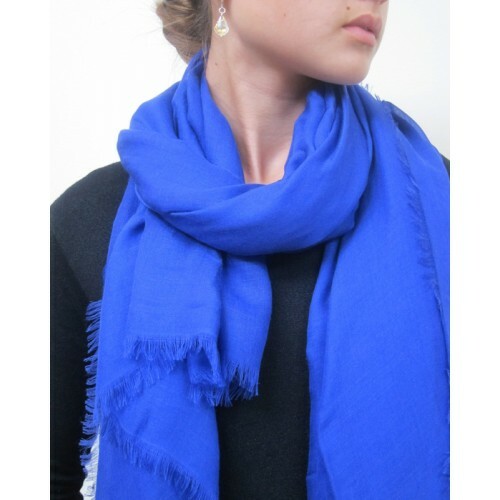 A royal blue scarf for that corporate dress. Are you planning to attend a formal dinner and are wearing something white, black, or cream? Then to compliment the outfit, bring a royal blue scarf along. A scarf of this shade offers more than just a pop of color from an otherwise boring motif, but as well gives off a sense of class. Royal blue is a shade that’s difficult to pull off; many users often look lousy when they match it with rather colorful outfits. This only indicates that the shade is reserved for extra-special events, such as formal dinners and parties. 3. Navy blue for daytime formality. Meanwhile, if it is in your everyday work routine to look casual but at the same time commanding, then wear a navy blue scarf. Use this as a neck accessory, somewhat like a tie on your light-colored blouse. This kind of scarf makes one look powerful, or at least more authoritarian in the eyes of the crowd. You can also hang the scarf around your neck, placed under the collar of your shirt. You can also do the same on a round-neck top if you are wearing preppy shirt-and-jeans combo. 4. Translucent powder blues for summer fashion. Dark blue is not a shade to wear during the spring and summer seasons, mainly because it is too heavy. But if you are looking to add this color in your sunny-day fashion, then go for the light shades instead. You may go for a pastel blue scarf over a casual shirt or summer dress, as it complements the colors of the season. You can also go for flowery shawls that have a pop of blue on them, as they help in achieving a girly look. But if you do want to wear a dark blue accessory against the heat, then go for a blue shawl at the beach. The intense shade works gives you a fresher vibe now that you’re by the sea; it also serves as a good cover-up for your swimsuit ensemble.